1Lt George E. Underwood (P)(KIA) - 15 dispatched (14 credited) missions flown: First mission flown as CoPilot with the 2Lt Loyd D. Gahimer, recently upgraded from CP to P and members of the Lt William T. Baker Crew. All other missions flown as First Pilot. KIA on 22 February 1944, mission 111. Body recovered and initially buried in the Burtonwood, England cemetery and later reinterred to the USA. 2Lt Creighton G. Doering (CP)(KIA) - 11 dispatched (10 credited) missions flown - All with 1Lt Underwood (93, 94, 95, 98, 99, 101, 102, 103, 104, 105 (Non Credited), 106) Was KIA on 6 February 1944 (Mission 106). Was hit with a 50 caliber bullet through the back of his head. Three bullets, believed to have been shot from a 379th BG(H) aircraft flying nearby, hit the B-17. One of the bullets was recovered. Body was returned to Molesworth. 2Lt Duane C. Parker (N)(KIA), T/Sgt Mack E. Daniels (E)(KIA), T/Sgt Charles F. Phipps (R)(KIA), S/Sgt Thomas E. Dinneen (BTG)(KIA), S/Sgt Glen L. Casselman (LWG)(KIA), S/Sgt Thomas L. Rike, Jr. (RWG)(KIA), S/Sgt Gregory C. Meyer (TG)(KIA). Flew on 14 dispatched (13 credited) combat missions - All with 1Lt Underwood (93, 94, 95, 98, 99, 101, 102, 103, 104, 105 (Non credited), 106, 109, 110, 111). All were KIA on 22 February 1944 (Mission 111). S/Sgt Casselman was awarded the Air Medal on January 27, 1944 and an Oak Leaf Cluster on February 13, 1944. 1Lt Milton S. Riley (B/N) - 32 credited missions flown: 9 with 1Lt Underwood as Bombardier (93, 94, 95, 98, 99, 101, 102, 103, 104, 106); 2 with 1Lt Lloyd L. Holdcroft as Bombardier (89, 92), Transferred from 360BS to 359BS for 21 missions: 3 with 1Lt Robert H. Halpin as Navigator (155, 158, 164); 14 with 2Lt Robert L. Cunningham - As Bombardier (167, 169, 170, 172, 174, 175, 176, 177, 183, 185), As Navigator (179, 180, 181, 186); With other Pilots - As Navigator (151), As Bombardier (187, 194). Completed combat tour on 29 June 1944 (Mission 194). 2Lt Joseph. 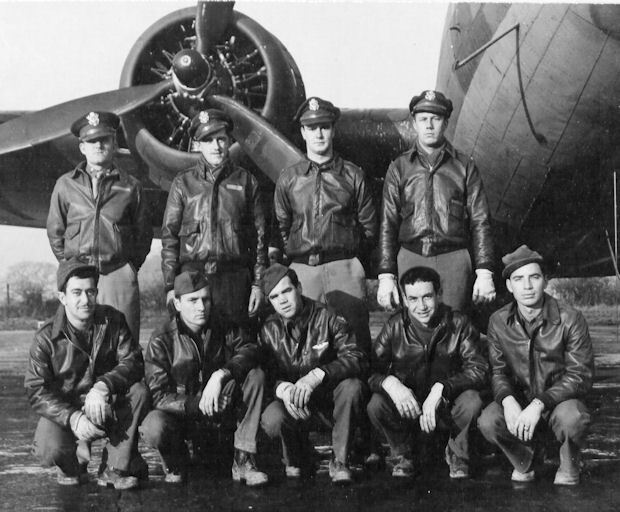 Massimiliano (CP)(KIA) - 8 credited missions flown: 3 with 1Lt Underwood (109, 110, 111); 6 with other Pilots - 1Lt Willard H. Bergeron (101, 102, 103, 104 (Aborted), 105; Lt William C. Heller (107 - As Lead crew Tail Gunner/Observer). KIA on 22 February 1944 (Mission 111). 2Lt George M. Walter (B)(KIA) - 10 credited missions flown: 1 with 1Lt Underwood (111); 9 with Lt John H. Parrott (99, 100, 101, 102, 103, 104, 106, 109, 110). KIA on 22 February 1944 (Mission 111). February 22, 1944, Mission 111 to Aschersleben, Germany in B-17F 42-29931 Devils's Workshop aka Satan's Workshop (360BS) PU-L. Flak disabled the #2 engine. Return trip was on three engines. The B-17 was lagging behind the Group formation near the French coast. Was last seen near mid-channel. Ditched in a very rough sea and all ten crewmen drowned. Three bodies were recovered: 1Lt Underwood (P), T/Sgt Daniels (E) and S/Sgt Casselman (LWG). They were initially buried in the Brookwood Cemetery, England. The names of seven crewmen names appear on the Wall of the Missing, Cambridge American Cemetery, England - 2Lt Massimiliano (CP), 2Lt Parker (N), 2Lt Walter (B), T/Sgt Phipps (R), S/Sgt Dinneen (BTG), S/Sgt Rike (RWG) and S/Sgt Meyer (TG).